The Bennington Area Chamber of Commerce has an information office just north of the center of Bennington on US Route 7. The office of the Bennington Area Chamber of Commerce is at 100 Veteran's Memorial Drive (US Route 7 North), about a mile from the intersection of Main and North/South streets (map). Open during business hours, the chamber can give you a good, detailed map of the town and lots of information on both the town and the surrounding region. 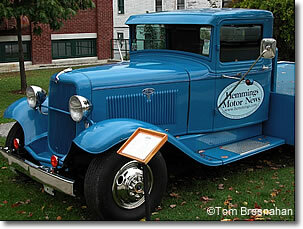 Antique Ford pickup truck at Hemmings Motor News, Bennington VT.